... and they went through a lot to get here. This apple is from a very old, very unhealthy tree. It's been growing slowly for months and has survived caterpillars, wasps, birds and who knows what else, as you can see by the eaten leaves. But the apple is perfect, sweeter than any I can buy in a store, and this tree keeps growing these beauties for us to eat every October, year after year. 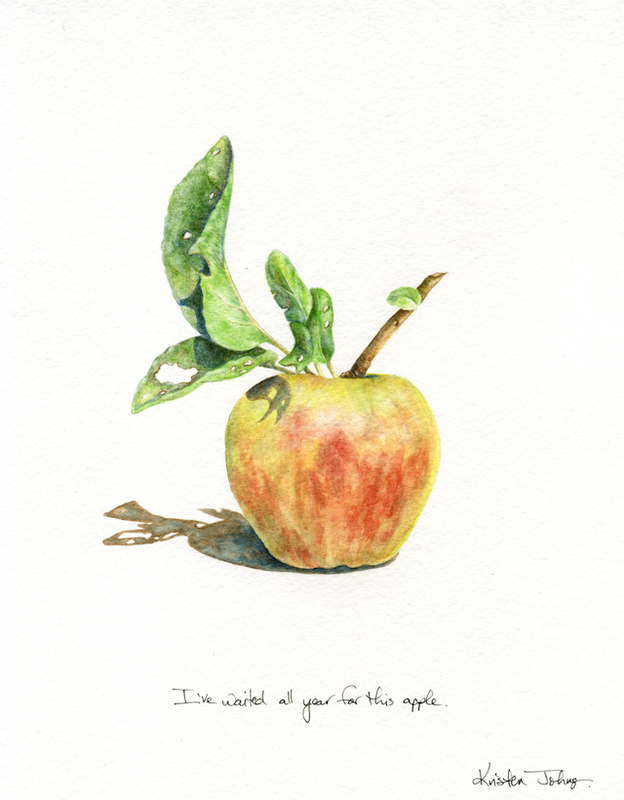 And so, I've named this picture: I've waited all year for this apple. My favourite painting of yours to date. I think it's the subject more than anything else - apples and I are soulmates. I feel the same! I can't imagine Fall without our bags and bags of apples. They soothe us into the rainy dark winter.